Key Difference: Knitting is a method that is used to produce fabric, by turning yarn into cloth. The term ‘knitted’ is derived from the Old English ‘cnyttan’, meaning ‘to knot’. Knitting is done using two or more needles. Crocheting is the process of creating fabric from yarn or thread using a crochet hook. 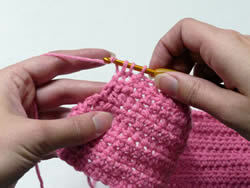 The term ‘crochet’ has been derived from the French word ‘crochet’ meaning “hook.” Crocheting is done using a hook. Knitting and crocheting are two different crafts that use yarn to create fabrics such as sweaters, caps, blankets and even decorative materials. At first glance, knitting and crocheting may seem exactly the same. However, people that have dabbled in both will tell you there are many differences between knitting and crocheting. Knitting is a method that is used to produce fabric, by turning yarn into cloth. The term ‘knitted’ is derived from the Old English ‘cnyttan’, meaning ‘to knot’. 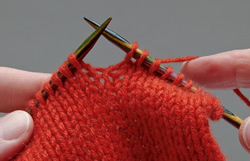 Knitting uses two or more needles that are made of metal for creating stitches. Knitted fabric consists of consecutive rows of loops, called stitches. Each stitch is produced by pulling a new loop through and existing loop. Stitches are held by a needle till a new loop passes through them. Knitting can be done by hand or a knitting machine. Different colored yarns and needles can be used to produce different colors, textures, weight and pattern of fabrics. The yarn in knitting follows a specific course of forming symmetric loops above and below the mean path of the yarn. These loops can easily be stretched into different directions, giving the knitted cloth its elastic properties. Hence knitting is used for fabrics that need to be stretched such as socks and hosiery. Clothes that are knitted are also more form-fitting due to the elasticity. The yarn used is knitting is thicker, compared to normal thread, making the garment bulkier and heavier. Weft knitting and warp knitting are two major types of knitting, with the weft knitting being more common. In weft knitting, the wales (loops) are perpendicular to the course set by the yarn, while in warp knitting the wales run parallel to the course. In weft knitting, a same yarn can be used to create the entire fabric, while in warp knitting a different yarn is required for every wale. Warp-knitted fabrics are most commonly used in lingerie as they are resistant to runs and are done by machines. Weft knit can be done by both hand as well as machines. Knitting is believed to originate in Egypt around the end of the first millennium AD. Hand knitting, though no longer used for commercial purposes, have become a hobby, where hobbyists meet up either in person or online in order to share patterns, techniques and interests in knitting. In the US and UK, there are podcasts, websites and clubs just for knitting. Crocheting is the process of creating fabric from yarn or thread using a crochet hook. The term ‘crochet’ has been derived from the French word ‘crochet’ meaning “hook.” The hook can be made of metals, wood or plastic. Crocheting creates stitches by pulling loops through other loops and wrapping the yarn or thread multiple times on the hook and then again being pulled through other loops. In crocheting, only one stitch is active at one time. Material that is crocheted are usually heavier and have more open stitches that not closely knitted together. There is no decisive evidence regarding when crocheting got its start; however it has been dated back to the 1800s. Some claim that the first published crochet patterns appeared in the Dutch magazine Pénélopé in 1824; while others claim it was first published in an 1847 publication A Winter's Gift. During the 19th century in Ireland, crocheting was being used as way to earn money during the famine. These days, crocheting is considered as an art and craft and is a popular hobby. There are major differences between knitting and crocheting, including types of knots, stitches and materials used. Although, both knitting and crocheting uses yarn, crocheting can also be done using thread. Knitting uses needles that differ in thickness and are used depending on the thickness required by the pattern. Crocheting uses a single hook that is used to create the whole fabric. When stitching, knitting looks like a bunch of braids and the thread creates an interlocking ‘v’ pattern. However, in crocheting the stitches are known as ‘posts’. Posts resemble loosely tied knots are linked in a chain. Kitting stitches are close and tight, while crocheting stitches are loose and more open. Knitting produces are thinner fabric, while crocheting produces a heavier and bulkier fabric. Knitting also takes longer to produce the fabric compared to crocheting. Crocheting produces granny squares that are popularly seen in Afghans and table cloths. Knitting needles are measured in numbers, while crocheting hooks are measured using numbers as well as letters.